It is really difficult to transfer songs from iPod touch to computer, because iTunes only let us sync songs to iPod. However, yesterday evening my computer crashed suddenly, and all music files on iTunes were lost. Hence, I need to transfer songs to computer for back up, and then what should I do? Here you are in the right place, besides iTunes, ImTOO PodWorks Platinum not only helps you do what iTunes can, but also helps you transfer songs from iPod to computer. Mac users please download the ImTOO PodWorks Platinum for Mac. Convert DVD/CD discs to iPod compatible video/audio formats and transfer directly to iPod or iTunes. Create personalized iPhone ringtones from audios and videos and transfer to iPhone or iTunes. Install and run the ImTOO PodWorks Platinum software (Close your iTunes first). 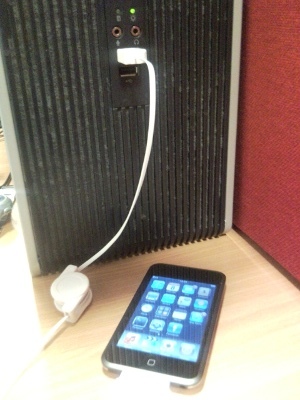 Step 1: Connect your iPod touch to computer using the USB cable. Your iPod touch information will be shown on the main interface clearly. 2. In the left directory tree, choose the source songs list from which you want to backup songs to local. All files in the selected file list will be shown in the right list immediately. 3. 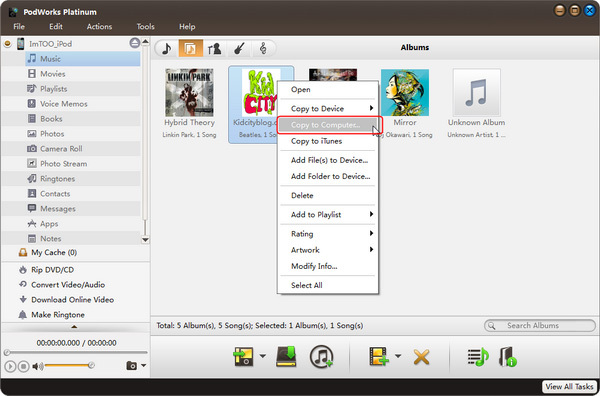 Check the wanted songs in the right file list, click “Copy File(s) to Computer” button at the bottom of the file list, and locate the target folder in the dialog box that appears, then start exportin. The transferring process will be finished in some secondes. Then you can transfer those songs to your new iPod touch. How to transfer songs, videos from iPod to iTunes?